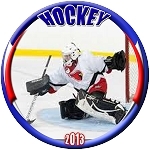 "Score A Goal" with a Personalized Photo Ice Hockey Puck!! The "Next Generation" in Ice Hockey Awards is here. 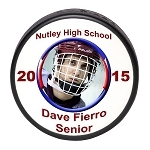 Our Personalized Photo Ice Hockey Pucks will "SCORE A GOAL" with players and coaches alike. All you need is a high resolution digital photo of your team, coach or players and Varsity Imprints will do the rest!! Your players and coaches will appreciate this photo ice hockey puck for many years to come! Be sure to order your Clear Acrylic Ice Hockey Puck Display Case to display your puck. As with our full line of photo sports ball products, our custom design work is included in the price of the photo ice hockey puck.